Kanungu, UGANDA , Jun 29 2012 (IPS) - It is midmorning at the Kanungu Health Centre IV and the queue of patients grows as more people start to arrive for treatment at this rural facility more than 400 kilometres outside the Ugandan capital of Kampala. Most are here to access family planning services, while some are waiting for cancer screening. Generally about 100 patients a day visit the health centre. But today there will be four times as many. “We see an average of 400 people a day when the doctor from Kampala visits once a month,” says nursing sister Kwesiga Muteisa. There are mostly women in the queue here, although some are accompanied by their partners. 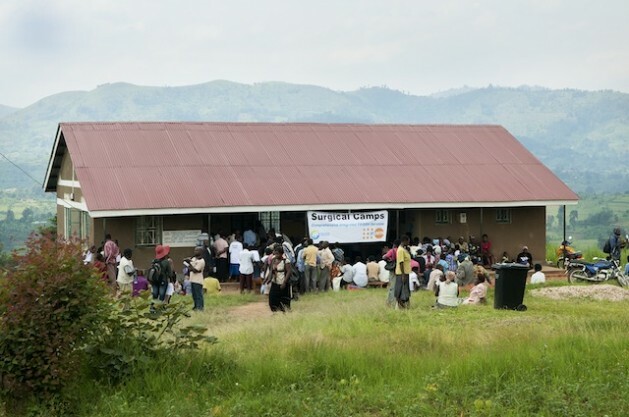 “Those who come with their husbands are served first to encourage male involvement in family planning,” says acting district health officer sister Rwabahima Florence. She explains that it also serves as an opportunity for men to undergo HIV counselling and testing, and to learn about other methods of family planning not commonly practiced among Ugandans, like having a vasectomy. The increased number of patients who visit the health centre are a testament to the success of the voluntary health team (VHT). Three years ago, the United Nations Population Fund (UNFPA), in collaboration with the Ugandan Ministry of Health and the Kanungu District Local Government, created the teams. UNFPA funds 95 percent of family planning services in this East African nation, while the government provides the remainder. VHTs consist of volunteer members from the community who are trained in family planning in order to encourage the practice in their areas. They conduct home visits and educate people about family planning, distribute condoms and refer patients to health facilities for more information and services. Each VHT is assigned to 25 households. Voluntary health team member and pensioner Babwicwa Mark beams from ear to ear, satisfied with the number of couples who have now embraced family planning in the Kanungu district. While the country’s 2011 Demographic and Health Survey (DHS) states that the contraceptive prevalence rate at national level is 26 percent, it is 41 percent in Kanungu. Making Ugandans aware of the need for family planning is vital in a country with the world’s third-highest population growth rate: 3.2 percent. “People in the communities listen better to the VHTs than the health workers, because at least they know them better than us,” explains Saturday Nason, a nursing officer and VHT trainer at the Kihihi Health Centre in the Kanungu District. Ugandan women give birth to an average of six children, according to the DHS, a 0.5 decrease from the 2006 average of seven. Nason attributes this decrease to family planning awareness. Although 26 percent of the Ugandan productive population of 15 to 49-year-olds use modern family planning methods according to the DHS, myths and cultural beliefs still stand in the way. Women are often subjected to pressure from men to produce more children. “The biggest challenge is that while many women want to adopt family planning and have fewer children, their spouses insist on more,” says VHT member Nyakato Peace, a mother of three. While the majority of women IPS interviewed at Kanungu Health Centre IV want an average of four children, the majority of men want seven or more. Twesigye Chrisente and her husband, Niwagaba Savio, are an example. The mother of four is satisfied with the number children she now has, but Savio wants seven and is threatening to marry a second wife if she insists on refusing to have more. “I only have a brother and sister and we’re not respected in the community because our family is small,” says Savio. Chrisente, on the other hand, argues that their income is barely enough to provide for the needs of the children they already have. Both husband and wife are subsistence farmers with no steady income. The couple had to undergo counselling at the Kinaaba Health Centre II in Kanungu District before Savio agreed that his wife could get a contraceptive implant. It will prevent her from falling pregnant for three years while Savio ponders whether or not to have more children. While Chrisente is assured of not having any more children within the next three years, the situation is not so easy for other women on different types of contraceptives. Peace says that once women experience the slightest side effects from contraceptives they tend to discontinue them, and this inevitably leads to unplanned pregnancies. The DHS reported that the use of modern contraceptives increased from eight percent in 1995 to 26 percent in 2011, showing increased demand for family planning services. However, there is a serious shortage of services in the area. The VHTs complain that pills and female condoms are not available in Kanungu. UNFPA assistant representative Dr. Wilfred Ochan says that there is a 41 percent unmet need for family planning in Uganda. He attributes this to inadequate funds and poorly skilled health workers. “However, we’ve made progress because it’s the first time we’re seeing a decrease in the fertility rate in this country,” says Ochan.